FL Studio (formerly known as FruityLoops) is a popular digital music production workstation, containing all the necessary tools for composing, arranging, recording, editing, mixing and mastering professional and high-quality music. FL Studio is designed with a graphical interface, relying on a pattern-based music sequencer that enable you to create fast and easy WAV, MP3, OGG or MIDI songs, beats or loops even as a first-time user. - Allows internal 32-bit floating point mixing, up to 96kHz stereo. - Support is enabled for DirectSound and Asio-based sound cards for audio output. 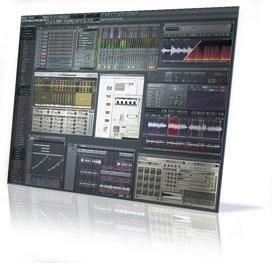 - FL Studio is able to work as a VSTi, DXI and ReWire client and also it can host ReWire clients. - Real-time linear interpolation and advanced interpolation algorithms are used at rendering time. - FL Studio’s functionality can be extended with ease as it supports third-party instruments and effects. - Contains a comprehensive collection of high-precision mastering and special effects filters: reverb, compressor, procedural equalizer, distortion, phaser, flanger, bass boost, delay line and others. - You can quickly enter realistic drum loops and compose complex instrumental thanks to the advanced sequencing methods contained within FL Studio. - Provides an advanced mixer featuring 68 mixer tracks, supporting up to 8 filters for each track, mixer tracks rerouting for creating complex mixer chains, track recording with support for ASIO input, an integrated procedural equalizer, volume and panning for each mixer track. - Contains various instruments such as Sampler, TS404, 3xOSC, Plucked!, MIDI Out, DX10, Scratcher, WaveTraveller, Wasp(demo), SimSynth Live (demo) and many more. - Provides an advanced playlist and full-featured audio tracks. - Has a built-in automation events editor and supports live recording of control movements. - Almost all the parameters can be controlled remotely via MIDI (VST plug-ins are also supported). - Special controller plugins allow procedural control over parameters. - Supports importing WAV, SYN and DS files with effects applied; MIDI sequences and controller events. - FL Studio is able to export audio to 16/32-bit as WAV or MP3 files. - MIDI notes and controller events can be exported to a standard MIDI file.